In November of 1979 Mark was discharged from the Navy and we were ready to continue our life in Muskegon. We moved in with Mark’s parents until we could find a place to live. Jobless, we went looking for an apartment. We found one we liked at Beverly Hills Apartments in North Muskegon and thought we would have to wait to rent until Mark had solid employment. Mr. Cryderman, the apartment manager, let us sign a lease and move in even though Mark didn’t have a job. One week later Mark landed a job at Bofor’s Lakeway Chemical as a maintenance mechanic. 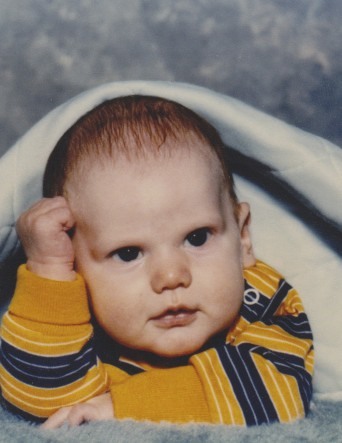 We moved into our apartment on December 1, 1979 and Chad was born on December 22nd. Everything was going great, but in February of 1980 Mark’s company went on strike for seven months. His pay was reduced to $25.00 per week which wasn’t enough to pay our rent for the month. We had been married a year and while living in Baltimore had saved money to buy a house in Muskegon. Now instead of buying a house we were surviving on our savings. Mark continued to look for a different job while on strike but no one would hire him because he was in the union. He was able to pick up a few odd jobs but not quite enough. Our savings dwindled over the next few months until we qualified for food stamps. We were both so embarrassed that we had to resort to food stamps but we had no choice. We had signed a year lease on our apartment so we couldn’t move back in with Mark’s parents without a lease penalty. We didn’t have any other bills but with our rent, utility bills, gas, food and formula just wasn’t enough money even with a few odd jobs here and there. So we went on food stamps. In the beginning we both went to the store late at night hoping not to see anyone. After a while I was too ashamed to go to the store with the food stamps so Mark had to go to the store alone. Shame on me. We were suppose to be in this together. I still feel badly about that decision. Mark is my foundation and always has been. This is the kind of stuff he has done for me our whole married life. Food stamps taught us some great lessons in life. It was a good lesson in humility and not being too quick to judge others. As a reminder we still keep a partial book of food stamps in our drawer. After seven long months of strike pay, Mark finally went back to work at the chemical company for a short while until he landed his job at Consumers Energy where he worked for 32 years. We are both very grateful for having wonderful jobs that provided us with steady income for so many years. Rosemary what a kind reminder to people. I remember Ron on strike while I was 8 and 1/2 months pregnant. I was unable to work while GTE was on strike. I know it was a few months but the ability to survive was there for us, too. I believe you are sharing this as I do not wish this on anyone except if they are in need of humility. It was certainly a lesson the world needs. There is no perfect world. We all have trouble waters sometime in life. It's how we ride the waves that make us who we are. You and Mark surf the waves and hang ten.